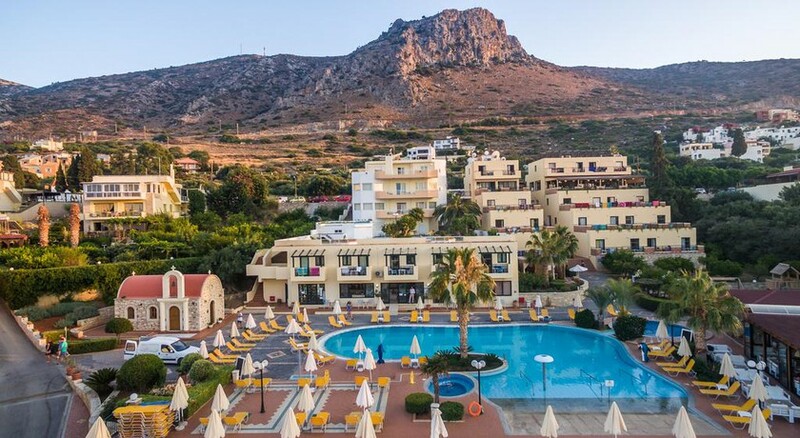 Asterias Village Resort is an all-inclusive, family friendly resort located in the Piskopiano village, 2.3km away from the picturesque Hersonissos Port. Run as a small family-owned hotel, this 12,000 sq. yards hotel looks forward to welcome guests with its amazing hospitality, traditional Cretan architecture, and an offer of Cretan and international cuisine at its restaurant- Oliva. Ideal for a family vacation, the resort caters to a blissful stay by the bay with uber-cool studios and apartments. Conceptualized Cretan loft rooms, a 300 sq. yards swimming pool and the rustic villages around provide a leisurely, laid-back vibe. Asterias Village Resort is located in Piskopiano, a small village of about 450 inhabitants, located 2.3km away from the Hersonissos Port. The Aquaworld Aquarium is at a distance of 1.4km while the Lixnostatis Folk Museum is 3.3km away. The nearest airfield is Heraklion International Airport, 26.3km away. 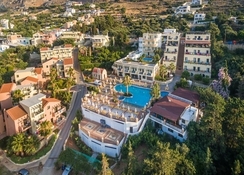 Asterias Village Resort offers several categories of rooms: one-bedroom apartments with sea views, studios with sea views and maisonettes with sea views. Guests can book rooms with sea/pool view which adds to it the beauty of the picturesque landscape, stone buildings and colourful and pristine landscape. The tastefully furnished guestrooms at Asterias Village Resort come with Wi-Fi, mini refrigerator, TV, AC, and other amenities. Asterias Village Resort is famous for the pre-dinner cocktails at the pool bar, while enjoying a warm dip in the pool in an elegant ambience. The 24-hour restaurant named Oliva is an open-sky lounge serving up authentic Cretan food a la carte. The grill bar has open-air entertainment with enticing cocktails to spirits to scrumptious dishes ranging from international to Mediterranean cuisine. The wooden open-air lounge provides a chilled out space with mild music. Also, the kids are catered with fun elements like light programs, a specially created pool for kids. Additionally, guests can request massages and therapies in the comfort of their rooms. Adults can enjoy the Jacuzzi facility. Tiny tots can have fun at Kid’s Club or Playground. The hotel has facilities for darts, bike rental and billiards. The hotel can arrange diving and snorkelling. Guests can also shop at the mini-market on-site. Can't fault this hotel. Friendly, helpful staff. Accommodation was clean and more than adequate. Facilities were good. Pool was great, plenty space for young children and adults. Lots of sun loungers.